The other day, while browsing the junk bin at my local thrift store I came across a pair of ankle weights. Lying between neon-green knee pads and mismatching dumbbells, they were almost overlooked. At $4, the price was right. I bought them because I have seen others add weight to the end of their stick for resistance training, so I thought they would work well for this application. Best part is, they are the kind that have small, removable sandbags so the weight can be adjusted accordingly. Why Train with A Weighted Stick? The concept of using a heavier object when training has been around for ages. Have you ever seen a baseball player swing two bats while on deck to hit? He does this so when he steps up to the plate, a single bat will feel almost weightless. A hockey stick can be very similar. When practicing shooting or stickhandling with a weighted stick, you are using the exact same muscles you would in a game, allowing you to strengthen the parts of your body that will make you a better player. If used regularly, you should notice increased handling speed and a more powerful shot. 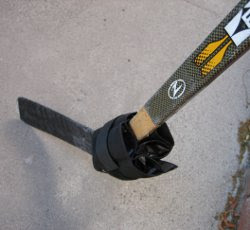 Jeremy from HowtoHockey.com put together an excellent list of weighted hockey stick drills you can incorporate into your training. This entry was posted on on July 7, 2010 at on July 7, 2010 and is filed under diy, skills. You can follow any responses to this entry through the RSS 2.0 feed. You can leave a response, or trackback from your own site.